Home » Blog » How to solve ANY Audio/Video or Electronics problem … Most of the Time! Almost everyone realizes that sometimes you need to reboot a computer to solve problems. Most customers of Time Warner digital video recorders (DVRs) have learned the value of “hard booting” or “power cycling” these boxes to solve audio, video or control problems. But it’s easy to forget that virtually all electronics are based on digital technology and processors, and sometimes a reset or reboot can solve all sorts of problems that crop up. This post is to encourage you consider trying this solution when your TV, DVD player, Audio/Video receiver, media player, remote control, and any other complex device stops behaving well. The range of problems that can occur is quite broad including a single problem, or a combination of problems related to the audio, video, or control of the equipment. Some problems are intermittent while others are persistent. In any case, power cycling is easy and will not hurt the equipment. The trick with some of these devices is that you can’t simply turn them off; you need to actually unplug them for about 30 seconds to force a reboot. For example, when a TV is powered off, some of its digital electronics are still active and powered up. 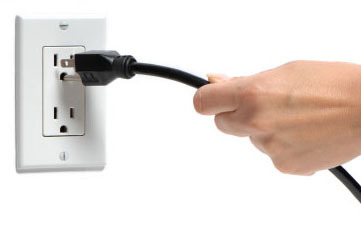 Some failures require a full power down that can only be accomplished by pulling the plug or cutting power to the power conditioner where the TV is plugged in. The same is true for DVD players (especially blu-ray players that stream internet videos), receivers that process surround audio and video, and other media players like Roku and AppleTV players. If power cycling the device doesn’t work, you can try a soft, hard, or factory reset. Every device is different in what is possible and how to do a reset. Many TV’s and DVD players have a menu item under support or setup that is a reset of the entire device and some part like the “smartv” capabilities. A factory reset will delete the customizations that have been made to setup the device (network info, picture settings) so that should be a last resort. Some devices have a reset procedure that is not obvious without reading the user manual, or more often, going to the support pages from the device maker. Examples of procedures that are often used are to press and hold the power button, or a reset button, on the component (not the remote) for up to 30 seconds, others have you unplug the device and hold a button depressed (like power) while plugging it back in, others have a combination of keys on the front panel that need pressed. It is actually quite remarkable how often a reset can “fix” a device that has died or has a serious failure. This is certainly worth a try before replacing it.